This is plate 14 from 'Sketches in Afghaunistan' by James Atkinson. This view was taken from the camp of the Fourth Brigade, about a mile and a half south of Kandahar. Atkinson described the fortified city: "[It] is situated on the north side of an extensive plain, about two miles from the lofty mountain called Baba-Wulee, and is surrounded by a mud wall, about thirty feet high, with numerous bastions; the length of the city is about 5000 feet, and 4000 in breadth, with a small stream running across the interior from north to south." 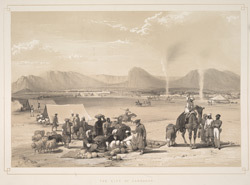 The second city of Afghanistan and its southern capital, Kandahar was ruled by a brother of the Emir Dost Mohammed. He fled north to Mohammed's stronghold of Kabul when the Army of the Indus approached in 1839. The chieftains in the city were bribed with gold. The British then organised a triumphant entry into Kandahar for Shah Shuja, to whom they bestowed an "official coronation" as Emir of Afghanistan, even though the crowd of Kandaharis was minuscule and unenthusiastic.